I stated loudly back in 2007 before that years ice loss shaped up into a record, that ice losses would allow clear sailing by 2012. This was not wishful thinking on my part but understanding and extrapolating the already well defined decline. My news release sparked a quiet news release out of NASA saying much the same. Obviously they had held back until they were forced by my news release. 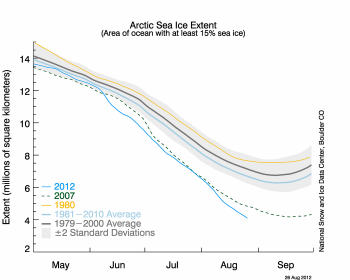 The sea ice itself has today reached what may well be described as its terminal phase. There is a minimum of multiyear ice and it is all well broken up. The area covered although highly variable on a year by year basis has now contracted so much that both passages are wide open this year. This can still be expected to vary greatly depending on winds, but I now think that the North West passage is clear four years out of five and the North East passage will be clear half the time. The areal extent has contracted so well as to make blockage difficult. This is all great news for shipping and cruise tourism. 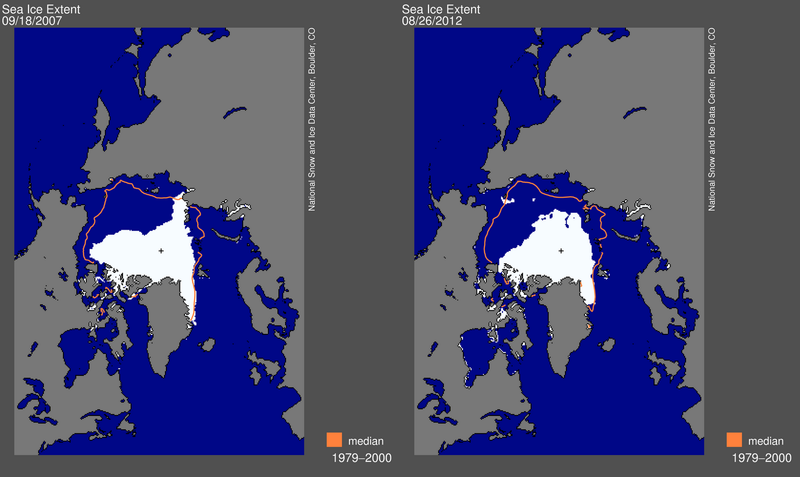 I do not expect the sea ice ever to reach zero for the summer low, but think that the injection of warm surface water that is causing all this will work to keep the summer sea ice well contained.